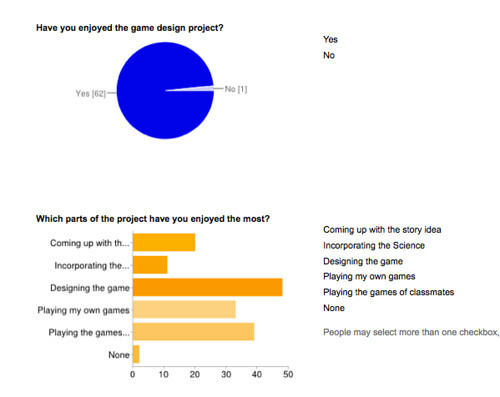 We neared the end of our video game design unit with a survey, and one of the questions I asked was simple: did you enjoy our inquiry into game design and the development of a video game project? Almost every single one of my students check off “yes.” But one single student didn’t. I did not ask them to put their names on the survey so I can’t say who that student was or what their thinking is. But I feel sorry for them, even if they never complained to me about it. 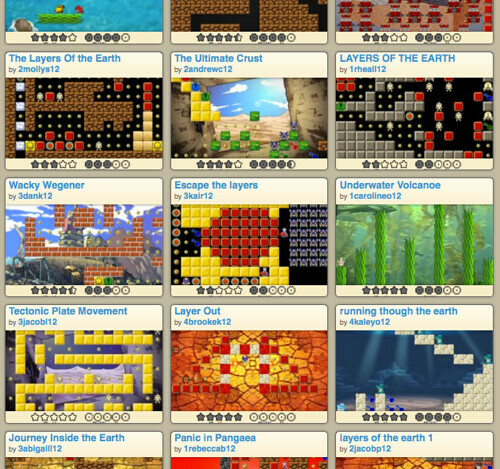 I suppose not every student is going to enjoy every single unit of instruction, but I do always hope that an innovative project like video game design will engage everyone — creatively, intellectually, academically. And there is a lot more to what we do around game design than design games – we explore science, symbolism, technology, digital media, and more. I was pleased to see that in my second question, asking what part of the unit they liked the most, the category of “designing the game” received the most clicks. Remember that one of my goals is to show them how to shift from consumer of information (games) into creator of content, so that is quite satisfying to see. They weren’t so hot on the idea of using a science idea in their own games, I see, but that is not surprising. For them, it may have handcuffed some ideas. For me, though, it was a way to legitimize game design in the classroom, and helped them to have a better grasp on difficult vocabulary and concepts. And they may never look at a video game in the same again, knowing now a bit about what it takes to create a simple game with a narrative arc.